A screenshot of us editing this article. Some website design firms try to set you up with a cheap site and then nickel and dime you for every small change such as spelling or punctuation errors. We make it easy to make changes on our sites yourself. Our sites our built using Content Management Systems, also called a CMS. CMS’s allow you to easily login and make changes without having to be as big of a nerd as we are. 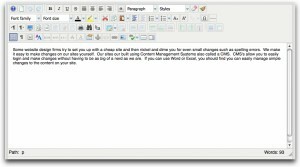 If you can use Word or Excel, you should find you can easily manage simple changes to the content on your site.